The cellist opens his eyes. The sadness she saw in his face is gone. She doesn't know where it went. His arms rise, and his left hand grips the neck of the cello, his right guides the bow to its throat. It is the ost beautiful thing she has ever seen. When the first notes sound they are, to her, inaudible. Sound has vanished from the world. She leans back into the wall. She's no longer there. Her mother is lifting her up, spinning her around and laughing. The warm tongue of a dog licks her arm. There's a rush of air as a snowball flies past her face. She slips on someone else's blood and lands on her side, a severed arm almost touching her nose. In a movie theater, a boy she likes kisses her and puts his hand on her stomach. She exhales, ad pulls the trigger. Then sound returns to the word. Arrow is a sniper and she is guarding the cellist so no one kills him. This is what happens to her when she hears his music. "if we stay they will shoot at us from the hills until we're all dead, and then they'll come down just the same." "The world will never allow that. They'll have to help us sooner or later." she says. He's not sure from her tone of voice if she believes what she says. He doesn't know how she could. They must both see the the same city disintegrating around them. "No one is coming." His voice is harsher than he means it to be. "We're here on our own, and no one's come to help us. Don't you know that?" Emina looks down, and fastens the top two buttons on her coat. She puts her hands in her pockets. After a while she says, very quietly, "I know no one is coming. I just don't want to believe it." Interaction between Dragan and Emina while waiting to cross a dangerous intersection and bridge. "I didn't need it. She didn't have to give me the cherries, either." Emina shrugs. "Isn't that how we're supposed to behave? Isn't that how we used to be?" "I don't know, "Dragan says. "I can't remember if we were like that, or just think we were. It seems impossilbe to remember what things were like." And he suspects this is what the men on the hills want most. They would, of course, like to kill them all, but if they can't, they would like to make them forget how they used to be, how civilized people act. He wonders how long it will take before they succeed.
" A woman has a friend come to visit," Emina says, her voice quick and light. "The friend comes in, and the woman asks if she would a coffee. 'No.' the friend says,'thanks, I'm fine.' The woman says, 'Great, now I can take a shower.'" Dragan laughs, even though he's heard the joke before. There are a half-dozen variations on it, but in each one the woman manages to do something large with an absurdly small amount of water. It's not far from the truth. Dragan is now able to wash his whole body with half a liter of water. A quarter to wash, a quarter to rinse. It's not the same, but it works. It's a treat if the water is warm. His head leans back slightly, and she sees that his eyes are closed, that he's no longer looking through his scope. She knows what he's doing. It's very clear to her, unmistakable. He's listening to the music. And then Arrow knows why he didn't fire yesterday. 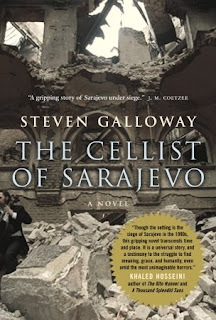 Arrow is getting ready to kill the sniper whose job it is to kill the cellist but she hesitates after seeing his reaction to the cellist's music. He's tired. He's tired from getting water, and he's tired from the world he lives in, a world he never wanted and had no part in creating and wishes didn't exist. He's tired of carrying water for a woman who has never had a kind word to say to him, who acts as if she's doing him a favor, whose bottles don't have handles and who refuses to switch. If she likes the bottles so much, she should carry them to the brewery, she should watch as the streets fill with blood and then washes itself clean, as a man stands with an empty leash and looks for a brown terrier while the dead are loaded into a van. Kenan gets up off the ground. He looks back to the bridge, at the spot where he hid Mrs. Ristovski's water. He turns away, and picks up the rope binding his own bottles. His back bends into its yoke. The water rises into the air. Kenan takes a step and then another. Soon he will be home. She closes her eyes, recalls the notes she heard only yesterday, a melody that is no longer there but feels very close. Her lips move, and a moment before the door splinters off its hinges she says, hervlice strong and quiet, "My name is Alisa." Hi Staci, I love the way you include lots of quotes.